Today was the longest journey outside of our base in Gracias, Lempira. Our Medical and Dental Teams traveled to Las Peñas, which is 2 hours away by car. Heather and Chloe, Pediatric Residents, stopping for a picture with the breathtaking Honduran scenery after a day's work. Members of the Medical and Dental Teams were both joined by local doctors and dentists today, which made our clinic fly by. A local Obstetrician/Gynecologist, Dr. Karla Guevara, also joined us and was able to perform prenatal ultrasounds. Karla also joined our group on many of our clinic days last year, so it was wonderful to work with her again! Local politicians and patients welcome our team to Las Peñas. Today the medical team saw an underweight 2 month old baby weighing only 2.3 kg (less than her birth weight). After obtaining the history and examining the baby, we determined her mother's milk supply was inadequate for her growth, and although she had been providing formula, it was expensive and she had not been feeding her enough. We luckily had formula with us, and were able to provide this along with instructions regarding safe preparation of formula, as well as give her anticipatory guidance for her infant's growth going forward. This adorable 2 month old, developmentally normal girl presented with low weight. Today we also saw a young child who's mother was told he needed to go to San Pedro Sula for an ultrasound of his head to rule out hydrocephalus (too much fluid in the ventricles of the brain). Fortunately, Karla was with us today! She is very experienced in ultrasound technique, and used her portable ultrasound machine, which was donated by our team in a previous mission, and performed his ultrasound for him. This saved the family an expensive trip to San Pedro Sula, and we were able to give the family the good news that he did not have hydrocephalus. Our dental team continues to be busy doing much needed work on children with a spectrum of dental decay and disease. They have been providing fluroride treatment, iodine treatment to reduce the bacterial load in the mouth, atraumatic restorative therapy (ART), and extractions. Multiple areas of tooth decay can be seen in the form of areas of brown discolouration in this young patient's mouth. Severe dental decay in a 5 year old girl. Again, we have been fortunate to have donations from community members back London, Ontario to assist us in helping these patients: each year members of our nurse, Esther Kern's church, the Valleyview Mennonite Church, donate vitamins and toothbrushes at the weekly service. We are thankful for these donations as many of the children we see do not even own a toothbrush. Esther Kern is a veteran of our group, and this is her 16th year coming to Honduras! Here, she is pictured in the pharmacy, where she provides medication and instructions to patients and their families. Today was the Rehab Team's last full day at CRILE, as tomorrow we plan on doing mostly home visits to assess and treat patients who are unable to come to the clinic. 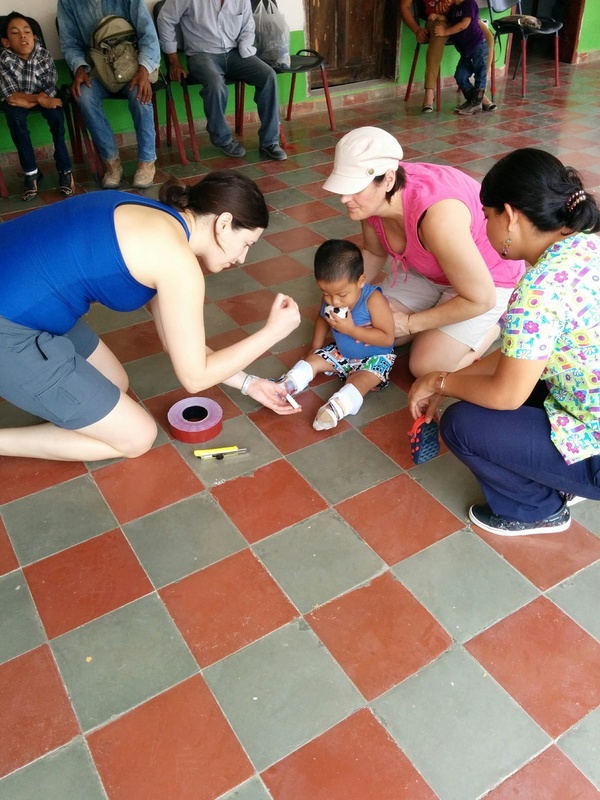 This little girl is being fitted for AFOs by Sharon (PT) and Ashley (OT) at CRILE with local physiotherapist, Ana, observing.